Karina's Kreations: New Year's Eve Party Cracker! 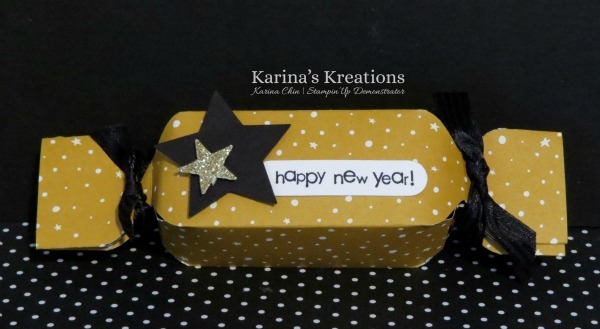 New Year's Eve Party Cracker! Do you have a New Years Eve party to attend tonight? Whip up a few of these easy party crackers to share with your friends and family. This cute project using the Envelope Punch Board and the new Going Place Designer Series Paper Stack that's available on Jan 5th. -Cut a piece of Going Places Designer Series Paper to 5-1/2" x 6". -Score the 6” side at 1-1/4” on each end using the Stampin Trimmer. -Score the 5-1/2” side at 1-1/4”, 2-1/2”, 3-3/4” & 5”. -Fold over the first score line and place the 6” inch side along the top of the Envelope punch board and line up at 1-1/4” mark. Punch. Flip over and do the other side. -Fold over the next score line and line up at 1-1/4” on the envelope punch board. Flip and do the other side. - Repeat 2 more times. -Place tear and tape adhesive on the ¼” edge. Seal up. -Pinch the sides and secure with Basic Black 3/8" Stitched Satin ribbon. I even made a video for you too! Enjoy!